A lake can hold a wide variety of structure that attracts fish, from rock piles to dead-fall trees, but often some of the best structure is man-made, including the boat dock. Any lake with homes or cabins on it has boat docks; and it is not unusual for a lake to have hundreds of docks. It is true that docks can be among the best places to fish for bass and panfish, but not all docks are particularly attractive to fish, and it takes the right approach to get the most out of fishing around docks. 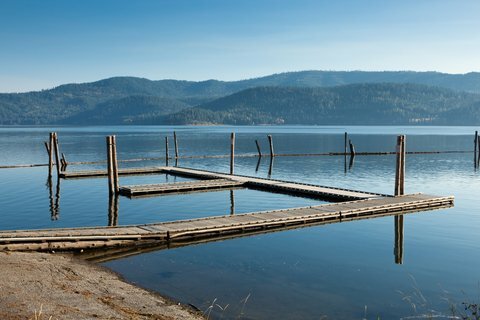 Often there are so many docks on a lake, it would take days to fish them all, so knowing what to look for can help you sort which docks may be productive and which you should avoid. In general, floating docks tend to be the least productive among boat docks. That is not to say that they will not hold fish, but like any other structure in a lake, the most desirable goes to the largest fish, while the least desirable is left for the smaller fish. Consider the floating dock the least desirable of dock structure. It has nothing that extends down into the water, which seems to be important to fish. Floating docks often hold plenty of small fish, especially panfish, but are less likely to hold large fish. Another factor to look for in fishing docks is natural dock versus artificial dock. Fish seem to prefer natural wood docks over non-wood docks made from plastic or metal. This makes sense from the standpoint that fish would be more familiar with wood over metal as a structure native to the lake. The top docks are those made from wood, with wood supports, but these types of docks are becoming increasingly rare. The next best choice would be a wood dock with dark colored supports. Once you have narrowed down what type of dock to look for, the next factor to consider is location. A dock near a steep drop off, lily pads, point, tributary or weedline is more likely to hold fish than docks that are not. The convergence of multiple structure types is especially attractive to fish. The final step in fishing docks is the approach. The most desirable fish are likely to be located along the outer edge of the dock, near the supports. It is here that the fish can most efficiently ambush prey. Rather than drop a bait directly on this location, the better approach is to cast well beyond this area and allow your retrieve to bring the bait past it. This reduces the chances of spooking the fish and provides a more natural presentation that will entice the fish to attack the bait. Shade is also important when it comes to fishing docks. Fish are more likely to be located on the shade side of the dock, rather than in full sun, so concentrate your first casts in this area. Learning how to fish docks is a skill that most anglers can put to use right away. Remembering the key factors in dock fishing will improve your catch and make for a more rewarding day on the water.